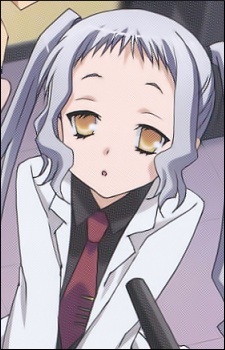 Ariel "Dai-sensei, Rie-chan, Head Teacher"
Haruna's teacher at her magical school, also known as Dai-sensei (大先生 lit. Great Teacher), who has an affinity for Kyoto-style tofu and sends Haruna to get her some due to her credit cards being overcharged. It is unknown what her true motives are. It is later revealed that she had planned to overthrow Lilia Lilith, the Queen of Villiers, a century before the events of the series, and appointed her top pupil, Chris, as the leader of the coup. It ultimately failed, and Chris and a few others involved took the fall; however, Ariel herself apparently managed to escape punishment.